Home › International › Hungarian demonstrations in Helsinki: after the Arab Spring, the Hungarian Spring? 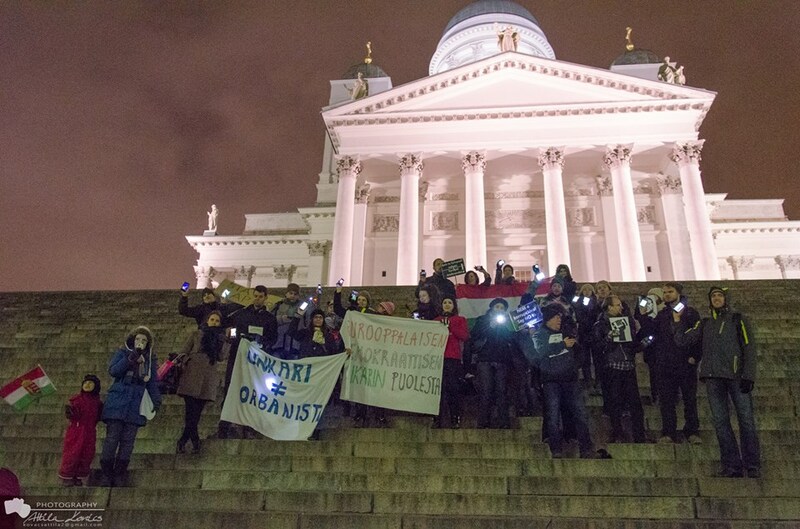 Starting last November, Helsinki citizens and passers-by can sometimes see groups of people demonstrating in the Finnish capital, either on Mannerheimintie, either in front of the Cathedral (photo). What can usually be seen is a group of Hungarians, joined by a few Finns, holding up flags, signs, caricatures and sometimes delivering speeches, be it in Hungarian, Finnish or English. Who are they and what are they doing in Finland? They are Hungarian – Europeans -, living in Finland, be it for days, months or years, coming from various backgrounds. What unites them is that they have preserved their Hungarian identity and they feel responsible for their home country and the European Union. They call themselves FMADM – Finnországi Magyarok a Demokratikus Magyarországért – Hungarians in Finland for a Democratic Hungary. They are not politicians, not by far, but they all want to do their best for Hungary. If you ask them, they will tell that their goals include expressing their solidarity with the protesters and groups in Hungary who represent the same values as they do; contributing to a free and democratic Hungary, fighting against state-level corruption and promoting transparency and civil control; informing the local public about Hungary and transmitting relevant facts and information about their country. So these democratic-minded citizens organize demonstrations – demonstrations that coincide with huge ones in Budapest, Hungary, attracting tens of thousands. So far, there have been three where Helsinki has joined: one in November, one in December and one last Sunday, on 1st of February (further information on the manifestation in Budapest is available here in English and here in Finnish). What are these demonstrations in Hungary (and in Finland) about? There were topical ones, and the present wave of public outrage started by citizens organising themselves last October against the plans of the Hungarian government to tax internet usage. make the value of the forint, the Hungarian currency, drop by 15 percent in the past four years. There are rumours of corruption, in particular in November 2014 when Viktor Orban was obliged to dismiss corruption claims cited by Washington as the reason for US entry bans on six senior Hungarian officials including the Head of the Tax administration. It is so serious that the row has further soured relations between Washington and Hungary, a NATO and EU member, which have worsened since Orban took power in 2010: in September, US President Barack Obama criticised Hungary for harassing civil organisations, while the top US diplomat in Hungary, Andre Goodfriend, said in October that “negative trends” have “rapidly taken hold“. For these reasons, demonstrators declared “that they do not accept, and that they will never accept that Mr. Orbán leads an anti-democratic government and turns Hungary away from Europe. They do not accept that Orbán’s government does not respect fundamental human rights and that it is corrupted beyond all measure. They are trying to show that Hungary is not Orbán’s government. To let Finland and the world know that their nation is democratic, diverse, tolerant and respects European values. Hungarians and Hungary are much more than what Orbán and his cronies want the public to believe“. According to one participant in the demonstration, demonstrators have an “ideal of a free and democratic Hungary, without institutionalised state-level corruption; a country where the rule of law, democratic values, human rights, political and social rights are respected and where the government is truly accountable to citizens; where the government respects the freedom of media and the freedom of speech; where the government does not question the country’s European integration”. These all seem pretty basic demands. Do these manifestations in Hungary (and in Finland) have any effect on Hungarian politics? It is clear that the Orbán government is not going to resign any time soon (they still enjoyed in April the support of 44% of the voters, with an extreme-right party proposing to make a government list of Jews, and wishing to deport gypsies to detention camps as a second in Parliament ) and the next elections in Hungary are not for years to come. It is true, however, that the protests to date served a crucial purpose: they contribute to forming a critical public opinion vis-a-vis the government, and citizens can now clearly see that there are opposing voices. In a few weeks, Fidesz, the governing party, has lost one million voters (for reference, there are approximately 8 million people with voting rights in Hungary) and was defeated at two by-elections. Due to public outrage, the government has had to backtrack on many of their plans (for example its plans to tax internet usage, motorways, etc.) which was never the case before. It is also becoming clear to the Hungarian (and international) public that Orbán’s governance is erratic. When looking ahead to the future, Europe’s reaction to Hungarian events will be certainly one to observe. Until now, the EU governments seem to have other priorities and to tolerate Orban’s government. But as expressed in the Washington Post, “if [the EU governments] pay no attention to anti-Western trends in Hungary, Turkey, Greece, and elsewhere in Europe and its periphery — a trend some fear might soon spread to Poland — they, and the United States, will find themselves isolated from a growing number of their allies in an increasingly hostile world”. If you want to know more more about FMADM and their take on Hungarian politics, to discuss Hungarian politics (including their effect on European politics) follow their Facebook page and join one of their pub nights (usually on Mondays, one per month) or the next manifestation!